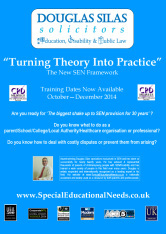 As you may know from my previous updates, I have been training people on the new SEN framework (both parents and professionals) during Autumn 2013, by holding (CPD accredited) training days at my offices called ‘Turning Theory into Practice’. I have also been providing this training and shorter, half-day/single onsite sessions, called 'What You Need To Know' (again CPD accredited), focused on the new SEN framework, for a number of parental organisations, schools, LAs, professional organisations, etc. "Excellent day - very helpful; learnt a lot." "This is the first training session that I have come across which has given me the relevant information without a 'spin' put on it." "The small group made the training feel very personal and understandable; the delivery felt sincere and considered. "Thank you Douglas for a most interesting and informative day!" Although I aimed the days initially at different groups (even though it is the same content for CPD purposes), some people have not been able to attend on particular days so they have been joining other days where they can. I have then seen how everyone seems to benefit also from hearing the views of others with different perspectives. Therefore, I have decided to put on these training days again during Spring 2015 that will be open to everyone. I will arrange these soon and will let you know the dates in my next update. Aside from receiving training from me directly, it is also a good opportunity to meet like-minded people (or for that matter to hear views from people who are ‘on the other side’) and share things within a positive environment. Feel free to contact my offices before this to find out if we have set dates yet to book a place on 020 8349 7700 or email me directly. You can download the flyer used so far by clicking on the picture above if you want to find out more information.